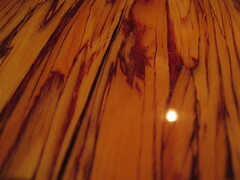 For Will's 23rd birthday, we went to Chambar (562 Beatty Street, 604 979-7119). 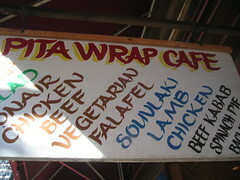 Cheap and cheerful Falafel at the Pita Wrap Cafe (565 Dunsmuir, 604 681-7634). I've been there many times but never had the combination of falafel with tabouleh which was a wonderful, tasty filling meal for $5.25. Excellent. I wish more Vancouver bloggers would compile such a list. I wish I had the time to do this myself! Where's the best congee in Vancouver? Barb and I and her Hong Kong born parents favour Kwong Chow on Main but I'd love to hear your favourite! Read more about Best congee in Vancouver? The Northern Voice organizing team had a fabulous lunch at the Zanzibar Cafe Bar (1851 Commercial Drive, 604 215-2008) today. $5.50 of fun with sponge cake and chocolate inside, yes! 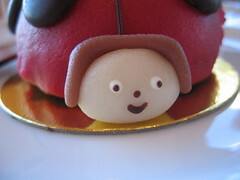 La Petite France continues to innovate and offer tasty savoury and sweet treats. 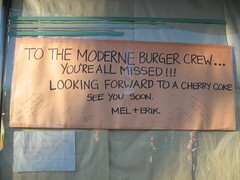 Judging by the photo above, we're not the only ones who are missing Moderne Burger after the recent fire at their neighbours. We miss Dan too! 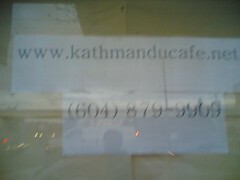 It looks like Kathmandu Cafe's (2779 Commercial Drive, 604 879-9909 opening date is in April. Great to see another restaurant opening after the Green Grape closed down. Enjoyed this tasty treat at dim sum at Sun Sui Wah on Main Street last weekend. Delicious and tasty steamed crab with garlic. Very easy to eat because it comes cut up into nice "easy to extract the meat" sized pieces. And afterwards you get noodles with garlic and the remainder of the crab. A good deal at $13.80 a pound. I would post some pictures but my digital camera is giving me troubles. Katherine is looking for recommendations for North Shore Persian/Iranian restaurants. Anybody? Read more about North Shore Persian/Iranian restaurants?